Happy Birthday, Auntie! Sunshine Cake for Everyone! 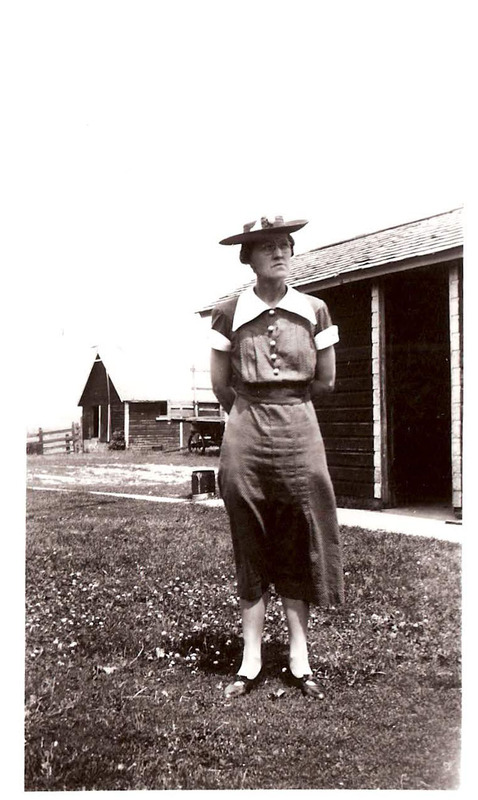 Adelina “Auntie” was born on March 31, 1894. Over the generations we lost track of whose true aunt she was. In 1943 she would have been 49 years old. 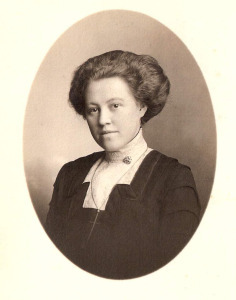 Her sister was my Great Grandmother, whose son was my grandfather and soldier in the Army. Auntie’s brother had served in WWI and letters between my grandfather and him show that he felt connected through war experience to Percy. Auntie served as the family member he could write to and share things that would have been too upsetting for his parents or his fiance, my grandmother. Auntie was always cheerful. She did not have any children of her own, so she often relied on my grandfather’s family of 11 for entertainment and get-togethers. She was devoted to all of us – all four generations over the years – as if she were a mother. She grew beautiful gardens of flowers. Peonies were her favorite. She stayed old-fashioned in many lovely ways. 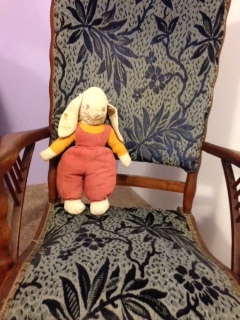 Her home was decorated in Victorian-era styles with bold wallpapers and crushed velvet chairs and couches. She had candy dishes full of Pepto-Bismol pink chalky mints. I have trouble wrapping my mind all the food innovations she witnessed in her lifetime. 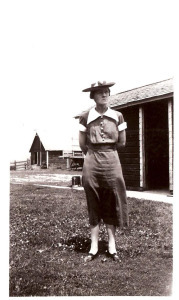 She did not incorporate indoor plumbing until the late 60’s. Her kitchen sink involved an old hand pump. In the same year she was born, Iceberg Lettuce was introduced. She was older than Hershey’s Milk Chocolate, canned tuna and date palms. She loved dessert recipes and held on to hundreds of cake, frosting, pie, and all other sorts of treasures. Maybe because it was an exciting introduction as a young child, she had every kind of date recipe one can imagine. was more needed for war production efforts. 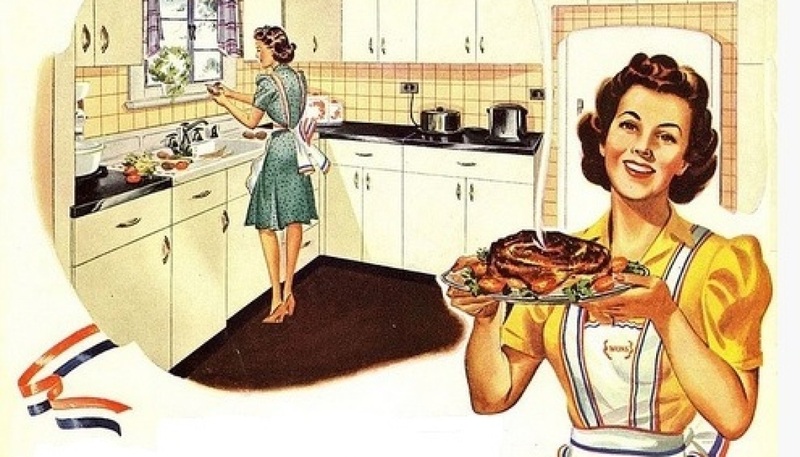 I don’t know for sure, but I imagine she was a homemaker who, like many others, viewed the “progress” and “modern conveniences” of the kitchen post WWII as trouble. The new way was one that would lessen the authenticity of homemade. Auntie’s all-time favorite recipes were fudge and Sunshine Cake. The fudge she made in large batches and stored in coffee tins on the stairway. She’d offer the fudge to everyone who stopped by. Sometimes the fudge didn’t keep so well and when she popped off the cover the whole batch would be fuzzy and green. The Sunshine Cake became a staple at the family birthday parties. There is family debate about the right recipe and ingredients. She was good about writing it down and sharing it with everyone, but some versions leave out the directions. Other versions are slightly different than all the rest. 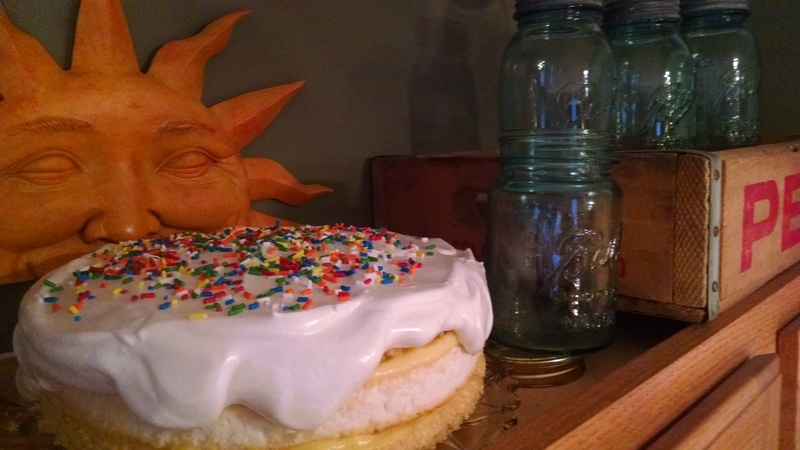 Luckily, the Sunshine Cake recipe was popular in its time and by patching together versions in the family and researching others online, it is possible to replicate Auntie’s favorite cake. For Auntie’s party tonight I made the filling from a lemon/orange custard and the frosting from a boiled sugar water (7 Minute Frosting) combination. Auntie loved a caramel filling and topping, but I think she would have approved of my revision. She probably would have asked to take the recipe home! The American Meat Institute was founded in 1906 in Chicago as the American Meat Packers Association. The organization was created shortly after the passage of the Federal Meat Inspection Act and spent much its early years helping meat packers adjust to new inspection requirements. 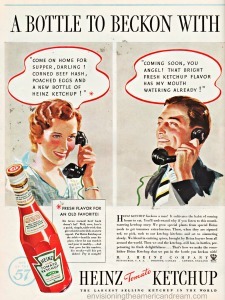 During WWII the Institute became instrumental in advertising to consumers to drive interest and demand of meat. With the rationing restrictions and shortages, many homemakers were learning to make do without meat altogether. Interestingly, in 1944 the American Meat Institute Foundation, was created with the sole purpose of allowing AMI to conduct scientific research designed to help meat and poultry companies improve their plants and their products. One of the premises of my project was to discover and describe how WWII brought on the emergence of food science. When it came to food, the US Army was most interested in delivering light-weight, non-perishable, and tasty food to soldiers. Eggs, milk, and many other dairy products turned to powder. Chemical preservatives and salt could extend shelf lives of products, allowing transportation overseas. What came first: corporations noticing the trend and applying it to the home front early in the war (who wouldn’t want to buy a little meal convenience), or corporations developing products and seeing a near end to the war and their new profits? I’m inclined to answer the latter. Returning soldiers found work and settled off farms. Once homemakers were off the farm, supply of dairy and other food was found in grocery aisles, not gardens. So, back to Frosted Meatloaf – I almost forgot! 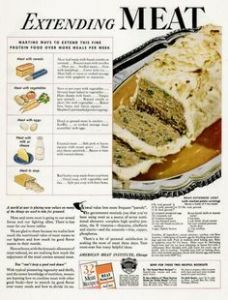 Through advertisements disguised as recipe pamphlets, The American Meat Institute introduced a new, creative, and meat-extending version of meatloaf in 1943. Frosted Meatloaf. It was a regular meatloaf with mashed potatoes “frosting”. I’ve never been a food mixer. I’d rather use one of those compartmentalized plates at Thanksgiving to keep my cold salads away from the warm sides. I don’t want my stuffing and gravy to touch. Frosted Meatloaf took me out of my comfort food zone. And I didn’t like leaving my zone. Hubby enjoyed the effort, presentation, and flavor. I, on the other hand, ended up deconstructing the thing when it got to my plate. Some things just shouldn’t be messed with, no matter how boring the original becomes. “Use it Up. Wear it out. Make it do, or do without.” — Mantra of the WWII generation. There will be many posts about this topic of wasting nothing. Everything about the home front during WWII involved making sure everything received its full use. In my kitchen I’m having trouble parting with some things that I have no idea how I’m going to use — twist ties from fruit bags, fruit bags, empty jars (non-canning), frying pan grease (stay tuned for that post soon!). Every piece of paper, foil, cardboard is getting used twice and then composted or recycled. With all this being said, it’s no surprise that every scrap of food must be used up. The EPA reported in 2012 that the US throws out 35 million tons of food each year. Estimates during WWII are around 4 million tons. How sad! 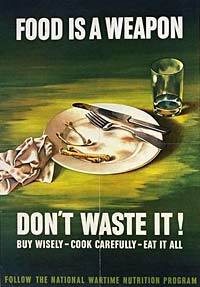 Of course, people living on the home front during the war were constantly reminded to not waste food. It was a matter of being a good patriot. While the sentiment about being mindful of those without enough to eat is still around, a big factor in food waste comes down to convenience – there’s no need to worry about using a ham bone to make broth since you can buy a can of it from any grocery store for very little money. Does anyone now have any idea how to take the giblet bag of a turkey/chicken and make it into a pan of gravy? Again, no…a can or a powder and some water will do the trick. So, back to my kitchen. You know when you make a pie and there always seems to be more crust than pie plate? What can you do with the scraps? I much preferred the idea of making a mini pie that could be contained in a lunch box. 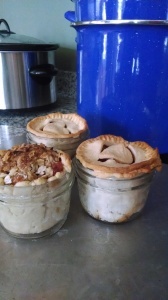 I simply pressed the leftover dough into a small mason jar, filled it with blueberries or apples and put them in the oven until they looked and smelled done. Mission Accomplished: No Waste Today! Come On Home For Supper, Darling. We Have Ketchup! Ketchup. Ketchup on burgers. Ketchup on fries. Ketchup on meatloaf. Ketchup on hot dogs (sorry Chicago). 94% of American households use ketchup. So, it is no surprise that I find a need to write about this critical condiment. Varying in points over the duration of the war, in early 1944 a 14 oz. bottle of ketchup was costing 28 points. Is that a lot? Yep. Consider that the allowed ration points for the month is 48 points per person. 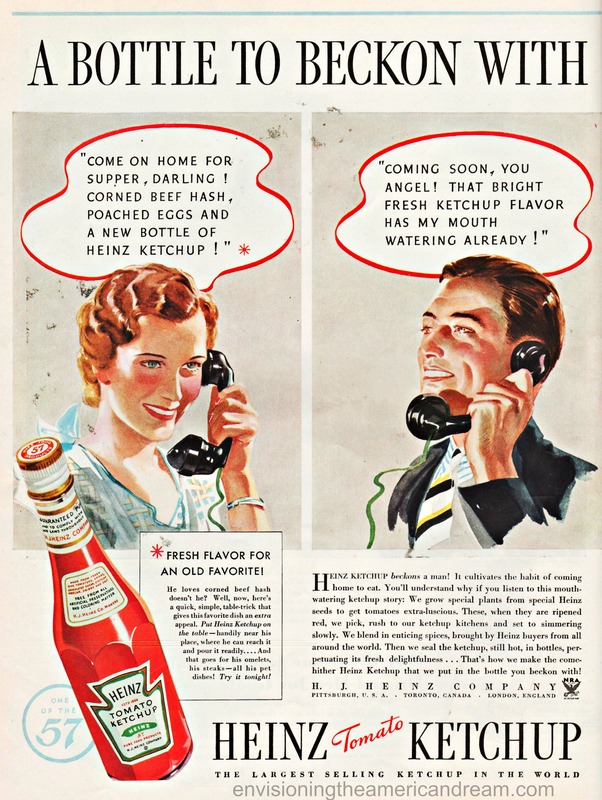 Even if you toss in the fact that a bottle might last you more than a month and even if you toss in the fact that a family of two has 96 points for the month to spend, ketchup was still one of those things that was considered frivolous. The equivalent of 28 points was 6 cans of beets or 2 cans of corn. I couldn’t see using up all those points on ketchup. Especially considering that the “economical” bottle of ketchup I could purchase is 64 oz. (really Sam’s Club? ), or a more fathomable amount of 28 oz. in the handy upside-down bottle, would cost me 128 points or 56 points respectively, I knew there was a better way. The earlier recipes with cloves, mace, nutmeg and other spices are recognized today by the most notable food preservationists: The Amish. Pick up an Amish cookbook and you’ll find the best variety of catsup you’ll ever need. Similar with a great story behind it is also Jim Ledvinka’s reminiscent blog post from npr.org’s All Things Considered. 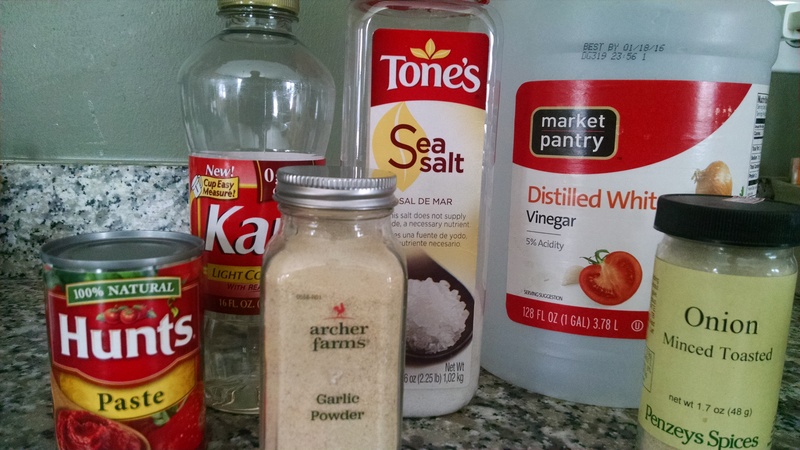 I prefer the good ol’ Heinz variety and I needed a recipe close to it. I found one online thanks to Todd Wilbur. It’s good. It’s very, very good. The problem though is, Tomato Paste. Yes, tomato paste can be a problem. 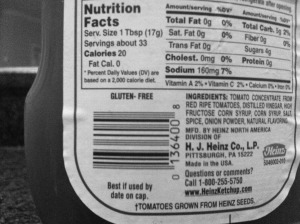 At the same time in 1944, tomato paste costs 13 ration points for a tiny little 6 oz. can. Okay, so it’s not a huge problem, like global warming or economic recession, but 13 points is still a lot of points. I am making a mental note to figure out how to make my own tomato paste later in the year when tomatoes are taking over the kitchen. You’ll notice in my recipe that I took the 1 T sugar out. Seriously – it didn’t need it. There’s no added sugar in the tomato paste and really the only sweetness comes from corn syrup. 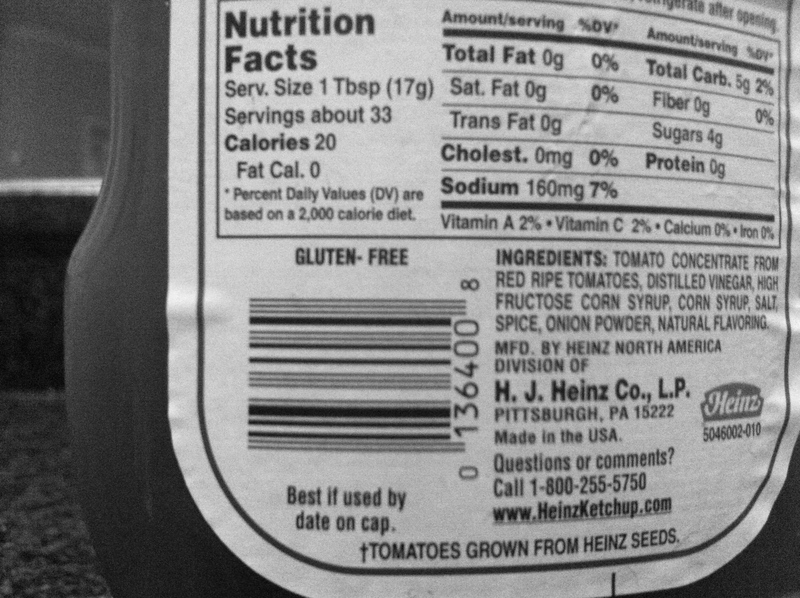 I also compared the recipe to Heinz’s ingredients on their label: Tomato concentrate from red ripe tomatoes, distilled vinegar, high fructose corn syrup, corn syrup, salt, spice, onion powder, and natural flavoring. High fructose corn syrup and corn syrup? Both? “Natural” flavoring? Like what? Well, we’ll never know. Combine over medium heat. Whisk. After boiling, simmer 20 minutes, stirring often. I store mine in glass jars for several weeks until it’s used up.